Sometimes the most interesting finds are the ones that you stumble upon by accident, and walking into the ‘Emporium of Optical Novelty’, by photographer and film-maker Simon Warner, was one such occasion. This pop-up curiosity shop was created as part of the Corn Exchange Leeds’ Grand Weekend and allowed visitors to examine a variety of Victorian optical toys including stereo cards, kaleidoscopes, zoetropes, flick books and magic lanterns. An experience that combined the translation of print into performance with audience participation seemed particularly relevant to my research, so I set about perusing the reference books on offer in search of more information about these kinds of objects. Included in the stack of information was an exhibition catalogue from the 2004 exhibition Eyes, Lies and Illusion at the Hayward Gallery, which consisted of ‘more than a thousand instruments, images and devices drawn from the remarkable collection of the German experimental film maker Werner Nekes [alongside] major works by internationally renowned contemporary artists showing how optical phenomena continue to fascinate to this day’. Belgian physicist Joseph Plateau created this optical toy, a precursor to the zoetrope, in 1832. The object uses 2 discs, one with images and one with slots, which when viewed in a mirror caused the appearance of motion. Invented in 1834 by William Horner, this object was originally referred to as a Daedalum (‘Wheel of the Devil’). It consists of an open drum with sequential images drawn around the inside and slots cut around the top. When the drum is spun, viewers looking through the slots will be able to see a moving image. The stereoscopewas originally invented in America by Sir Charles Wheatstone in 1838. He first developed the process using drawings before the use of photography became widespread. A stereoscope produces a 3D image through mounting two images of the same scene next to each other. Each picture is taken from a slightly different viewpoint that corresponds closely to the spacing of the eyes. When observing the pictures through a special viewer, the pair of two-dimensional pictures merge together into a single three-dimensional photograph. Magic lanterns are the equivalent of today’s slide projectors and have been in use since the 1600s. However, unlike slide projectors, magic lanterns used fire instead of bulbs to light the slides. Also, slides came in strips which could include complex mechanical features to allow the projectionist to create moving images onscreen. The chromatrope is similar to a kaliedoscope in that it creates a colourful moving pattern. However, they worked in slightly different ways, as a chromotrope is a mechanical slide, made up of several disks of coloured glass that turned when rotated by an exterior handle. When lit from behind by a magic lantern, the changing patterns could then be projected onto a wall. The praxinoscope was invented in 1877 by the Frenchman Charles Reynaud, as a development on the zoetrope. Similar to the zoetrope, the praxinoscope is created by inserting a band of images inside a cylinder. However, instead of viewing the images through slots, they are reflected in mirrors set inside the cylinder, which creates the impression of a moving image when rotated. This was developed into a way to project images onto a screen, and from there Reynaud introduced longer rolls of paper, creating the ‘Theatre Optique’. This week I attended some media training sessions organised by VOX coaching in an attempt to overcome my natural shyness of public speaking. The sessions ran over two days and covered presenting to camera, storytelling and effective networking. The company employs trained actors so a lot of the exercises focused on performance techniques, specifically ones which allowed the speaker to shift their focus away from themselves and towards the audience. The first session considered how we approached the camera, including tips on stance, hand gestures and line of vision. Each person took it in turns to present a short introduction to camera before receiving feedback from the rest of the group. Although I was nervous at first I managed quite well with the task, despite a bit of fidgeting. The audience reaction was generally favourable, however they did pick up on my descending intonation, a particularly British affliction, where the tone of voice goes down at the end of the sentence. Unfortunately, this can also contribute to the voice trailing off and losing authority. Thankfully, this can be counteracted to an extent by developing vocal strength through using simple breathing techniques. The second session focused more on networking and the way we communicate. As researchers, we are learning to be experts in our field, that is, to be the voice of authority on our chosen topic. A large element of that role involves maximising the impact of our research, in other words how we share this knowledge and make people care about it. Unfortunately, the content that we are communicating only accounts for 7% of what our audience notices. The rest is divided between visual cues, including body language (55%) and vocal tone (38%). This means that although the message is important, the way that the information is conveyed is even more so. Furthermore, when delivering research findings or facts, it is easy to slip into list based monologues which leave your audience uninspired. When structuring content therefore, it is useful to decide how you want your audience to feel as a result of your presentation, and select the content or style to suit that particular outcome. The oveall aim of the sessions was to develop a performance toolkit which would be useful in 1-on-1 networking, presentation and/or media situations. My favourite tip however was the reminder of a basic, but often neglected, element of communication: the pause. Remembering to pause helps to break up your points to allow breathing space and for the audience to reflect on what you have said. A good exercise is to rehearse presentations out loud and force yourself to stop after each point. Relevance: What does your audience want to know and what do they need to know? My studio work has increasingly begun to explore the spaces between art, artefact and interpretation as a way of layering meaning in order to aid audience interaction with the art object. The artist’s book as a medium therefore seems entirely fitting to this task, given how it interrogates its own form, whilst allowing space for expressing additional content relevant to its materiality. This interest has led me to explore re-workings of original manuscripts, not only of early science and alchemical works (in week 18), but also early literary and religious texts. The understanding of how these subjects overlap in the pre-modern world view also sheds new light on our own modern obsession with the segregation and purification of genres. Recently, it seems that this exploration of original manuscripts is also of interest to other artists, allowing plenty of opportunities for the contextualisation of my work outside of an academic context. Examples of these kinds of works are currently on show at the John Rylands Library in Manchester, who staged an exhibition and conference in response to the 700th anniversary of the birth of Boccaccio, writer of the Decameron and contemporary of Dante. In true allegorical fashion, the exhibition charts the changing attitudes to, and interpretations of Boccaccio’s works from the 14th Century to the present day, in order to understand the significance of his work in the 21st Century. The exhibition catalogue is separated into sections detailing many different elements of Boccaccio’s works and interests including, his response to the role of women in 14th Century Italy; his work as a cultural mediator and humanist; innovations in print and aesthetics of the book; and the effects of censorship laws on the work. This exhibition of historic printed books and manuscripts showcases every one of his works, representing the breadth of the Rylands collection which includes the first illustrated edition of the Decameron. In addition to these literary works, Boccaccio’s achievements also include the development of ‘octave rhyme’ (ottava rima), and his prose writing becoming the basis for the standard Italian language used today. Alongside these examples of printed texts and manuscripts, the curators also invited an international group of artists to respond to elements of Boccaccio’s ouvre. The brief for producing the work was left deliberately open and inspired a broad range of responses. The 13 artists included in the exhibition were Carolyn Thompson, Carolyn Trant, Glynnis Fawkes, Heather Hunter, Horst Weierstall, James Reid-Cunningham, Jeremy Dixon, John McDowall, Mike Clements, Paul Johnson, Shirley Greer, Steve Dales and Sue Doggett. The range of works on show gave a good overview to how artists might produce interpretations of historical works as new artworks in their own right. My particular favourites were by Heather Hunter, John McDowall and Steve Dales, as I felt that they explored the form of the book in interesting ways in addition to the content. 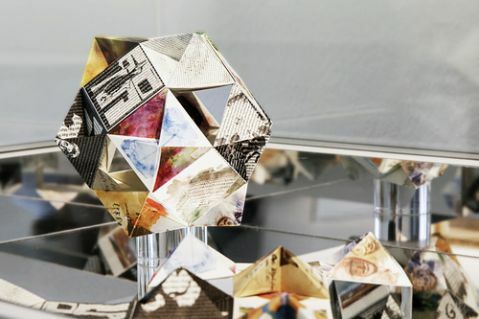 Heather Hunter’s work entitled ‘Famous Proba – found’ used the ‘designating duet’ method from ‘Woven and Interlocking Book Structures’ in order to create a patchwork of hand and digital prints incorporating a found poem (cento) and images. The term ‘cento’, from the Latin ‘cloak made of patches’, determined the format of the book. The format of the poem referenced the Ancient Greek tradition of poets creating new works entirely from lines or verses taken from Homer, and was taken from a word pool collected from ‘On Famous Woman’ by Giovanni Boccaccio. John McDowall’s book ‘Giornata prima’, rebound pages from the Decameron in sequence by taking pages from each edition and selecting the corresponding page (the first page from the first book, the second from the next and so on) to produce a new version incorporating the different interpretations of the work through time. Steve Dale’s book ‘Untitled Alterpiece’ took inspiration from Boccaccio’s ‘De mulieribus claris’ and represents contemporary inspriational women as selected by friends of the artist. The main work is based on the St. Humilitas polyptych (see image) and is accompanied by a booklet which details the reasons for each selection and is embossed with an image of Eve on the cover. More examples and images from the artist book exhibition can be seen here. I’m coming to the end of the first academic year and, even though I’ll be continuing to work through the summer, my thoughts have already turned towards the end of September and the second year of the doctoral programme. The second year (as detailed in week 19) involves the process of developing methodologies with which to create and evaluate new work and knowledge. 1. way of proceeding or doing something, esp. a systematic or regular one. Their commitment to developing new research terminology for practice-led research results in a ‘bilingual’ paper, which charts existing scientific research terms alongside potential artistic equivalents as follows: ‘If meaningful research is to be carried out in any discipline, a suitable strategy / methodology for acquiring new knowledge must be identified. This procedure should be thorough / rigorous, open / accessible, easy to understand / transparent, and be useful in other contexts / transferable (in concept at least).’ This not only helps to elucidate the differences between the concepts of methods and methodologies, but also highlights the ways that these can intersect with art practice. Gray and Malins (1993) continue by detailing the characteristics of existing methodologies in the arts and sciences, by comparing and contrasting these disciplines. Through separating the disciplines into categories, they are able to establish common factors of research, with which to begin devising new working strategies. Scientific models are separated into Newtonian and Quantum sciences, with the former defined by positivism, empiricism and reductionism, and the latter detailing ‘concepts of subjectivity, observer’s perceptions, simultaneity, relativity, uncertainty, randomness, indeterminacy, subatomic anarchy, chaos’ as a response to previous limitations in scientific methods. In addition to these, the social sciences (in contrast to direct observation) favour interpretive and contextual methods, otherwise referred to as qualitative methodologies, which include the use of phenomenological, hermeneutic, axiological, ethnographic and dialectical strategies. The development of quantum and social science methodologies in response to the limitations of empirical science therefore offers potential strategies which can be adapted for use in artistic research, as well as a development framework in order to create new practice-specific methodologies. Examples of principle research procedures which have been adapted for Art and Design research include processes relating to historical, philosophical, experimental, comparative, descriptive, naturalistic, and practical inquiry. Artistic research procedures have also been articulated through the work of Cornock (1978, 1983, 1984), who suggests a cyclical structure of practice and reflection as inherent within artistic endeavour, which he separates into 6 stages: generation, selection, synthesis, articulation, presentation, and critical discussion. As these correlate with common factors of research identified in scientific methods (hypothesis, data collection, problem definition, development, critical context), this suggests that practitioners may already follow many of these research procedures, if not explicitly. Such analyses, often mistaken for curatorial interpretation, can now be viewed as a methodological document or manifesto of the practice. This therefore creates an understanding of how the art practice functions as research, as well as greater transparency around how the audience should approach the text.